or call (866) 453-4480 and be sure to mention you are part of OAMR. The Academy is an all day session held on Wednesday. It may provide three education points for both CMC and MMC candidates. In order to receive educational points for attending this Academy session, you must complete a course assessment (KTAP) to meet IIMC requirements. The Annual Conference is Thursday and Friday, filled with educational concurrent and general sessions. Registration includes a name tag lanyard, which should be worn for the duration of the conference. It will include a meal ticket for the Friday night banquet. Lanyards also have ribbons which designate new members, special guests, speakers, vendors, past presidents, Conference Committee, and the OAMR Board. 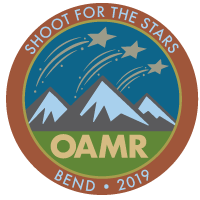 Watch for the new member / first time attendee ribbons and make someone feel welcome with a big OAMR hello! The Business Meeting will be held Friday morning. Packets are available on the website prior to conference. Meals included with the full conference registration are lunch on Thursday; and plated breakfast, lunch, and Annual Banquet on Thursday. Extra tickets for any event can be purchased at the registration area. Breaks are generally provided twice a day. Use these breaks to visit with exhibitors, network with other recorders, shop at the OAMR store, purchase raffle tickets, and view/bid on silent auction items. Beverages will be available daily and an occasional sweet treat might turn up. Region pictures will be taken during the breaks (location and times to be listed in the conference handbook). New Board, Past Presidents, and Special Guests will be taken during the President's Reception just prior to the Banquet. Please be at the location on time to keep on schedule. Conference attire will be "business casual". The Annual Banquet on Thursday is "semi-formal" wear. The key is to be comfortable throughout the conference. Conference and event attire should be whatever is comfortable for you, normally most do business casual. The conference rooms can be chilly so a sweater or light jacket may be in order. No matter what you wear don't let clothes keep you from attending the banquet and being able to enjoy the full experience! We want you to have a wonderful time! First time attendees are invited to attend the Mentor/Mentee/1st Time Attendee Introduction on Wednesday to welcome new and first-time attendees to the conference. All conference attendees are invited to attend the President's Reception. The Annual Banquet will be held on Thursday night. These supporters of OAMR are a vital part of putting on a great conference. Please take the time to visit their booths, introduce yourself, and get your door prize form signed. All Exhibitors will be invited to attend the Thursday lunch, so please welcome them and voice your appreciation for their support of OAMR as many are also sponsors. A few years ago, OAMR started doing a community outreach project for a charitable organization in the city hosting our conference. The 2018 non-profit was Clackamas Women’s Services & Shelter in Portland. Please sign up to serve on one or more of the OAMR committees, which are the backbone of our organization. Your contribution of time, ideas, and effort are greatly needed, appreciated, and invaluable. Forms will be located near the registration desk. Most of the meetings for the committees can take place via email and telephone, so don't let distance be a deterrent to signing up. Visit OAMR's Flikr page to view photos from the OAMR Annual Conference.